Ready for an energizing dance adventure? Learn how to dance like the Bollywood stars! Contact me to reserve your spot!! I have rediscovered dance with Veronic! She takes you beyond just the performance, and invites us into her playful world that is centered around the joy of simply just dancing. Her passion is contagious and her teaching approach unique. 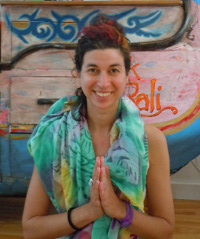 In class, she inspires us with her words, and encourages us to savour every movement...each class is a delight! — Catherine B. Learn to Dance Bollywood, Just Like in the Movies! Why go to the gym when you can get in shape to the joyous and positive rhythms of India? Forget about your stress, build your energy, improve your flexibility, coordination and balance and have fun at the same time! Don't worry if you're not familiar with Bollywood dance moves, as Vero will guide you step-by-step into this colourful, and playful world! Each class consists of a warmup, technique exercises, and a short choreography set to popular Bollywood movie songs—perfect for dancers of all skill levels. So whether you're a pro or a beginner, express yourself to your own rhythm, literally dance from head to toe, and discover the energy, elegance and beauty of Bollywood dance. Saturday choreography Bollywood workshops!!! These special workshops are open to everyone and focus on learning a Bollywood choreography. Beginners welcome!! Come learn some energizing and playful dancing!! LET'S CELEBRATE SPRING!! Introductory Bollywood dance workshop - open to everyone! We are celebrating Holi! a colorful festival through movement, music and dance!! Join us to discover Bollywood dancing! 7 years old and up. Reserve your spot now by contacting me with the class of your choice! And send your non-refundable deposit of $50 is needed to confirm your participation and reserve your spot. Wear comfortable clothes and feel free to accessorize and add splashes of colour! Vero Bollywood dance classes are organic and accessible to all. All you need is the motivation to move and/or to discover something new. If you're interested in private group lessons, a fun fitness activity for an event (Birthdays, Bachelorettes, Corporate Events) or a specialized workshop focused on dance techniques, drop me an email! Classes and workshops are flexible and created to adapt to what you're looking for. Thank you to all participants of my dance classes and workshops over all these years. It's beautiful to see people discover new things about themselves and to share positive energy through dance. March 2017 Véro in LA PRESSE+ on Dance Choreography « Le plaisir des chorégraphies ». Follow Vero Bollywood on Facebook for more information, updates and for upcoming activities, events and classes. You can also subscribe to our newsletter to know what's going on, what's coming up and for exclusive offers!